The reader must be wondering whats so great about this menu ? Its heavily in favour of south Indian dishes and doesn’t contain any roti varieties and these are everyday items made at home… right? Yes, these are everyday items that you make at home but all these are things that we have been eating on our road trip for the past 20 days :). Some items are yet to be made and they will be made over the next week as we continue to travel. Till I was introduced to OPOS (One Pot One Shot), the revolutionary cooking methodology developed by Ramakrishnan and the team at UBF, I would not have dreamt of eating 90% of these as we were travelling. Veg Biriyani in 8 minutes, Semiya Upma that doesn’t clump in a pressure cooker, Idiappam without breaking into a sweat and developing my biceps, Pav Bhaji in 4 mins ??? OPOS takes the pressure out of cooking and the pressure cooker suddenly is a “pleasure” cooker. To know more about this buy the book “OPOS Cookbook, 5 minute magic” by Ramakrishnan on Amazon or join the OPOS Support group on FB and create your own magic !! I am the “world’s greatest packer” .. no one has given me the tag, I am self-certified :):). I inherited my ability to pack things from my dad who had this title before me. When we travel, I pack all the essential masalas in one bin in 100 gm bottles. And put the item name on the lid so that as I place them inside a bin, its easy to pick out what you need to cook with that day. If you are travelling to cities then its easy to buy what you want but I prefer to carry the masalas I need in small quantities because running to a spice store isn’t always possible. Some staples in my masala box – red chilli powder, mustard, Garam Masala, Sambar Powder (home-made), Rasam Powder (home-made), OPOS Puliyodare spice powder (home-made), Biriyani Masala (with some additional spices and ground at home), dry roasted – Coriander seeds, Cumin, Saunf, and peanuts. Besides these masalas I also carry salt as we use non-iodised rock salt and you don’t get it easily everywhere. Some items that I carry may not be required by most people – Sabja seeds, Kalonji seeds (for instant pickles), and Coconut milk powder. I also carry the biriyani staples like cardamom, cloves, bay leaves, star anise in tiny quantities as shown in the pic above. 3. The Andhra Senagala Karam Powder (Dal powder) is Krishnan’s favourite so I make a tiny batch of this always to carry with us – the recipe is very simple – 1/2C of roasted bengal gram (Pottu kadalai, bhuna hua chana), salt to taste, 1 TBSP red chilli powder or more depending on how spicy you want it to be, four to five cloves of fresh garlic. Dry grind all of these and use the powder within a month to 45 days. 4. I sometimes carry regular rice and basmati rice, but if the trip is longer, I just carry for a couple of days and then keep buying everywhere. 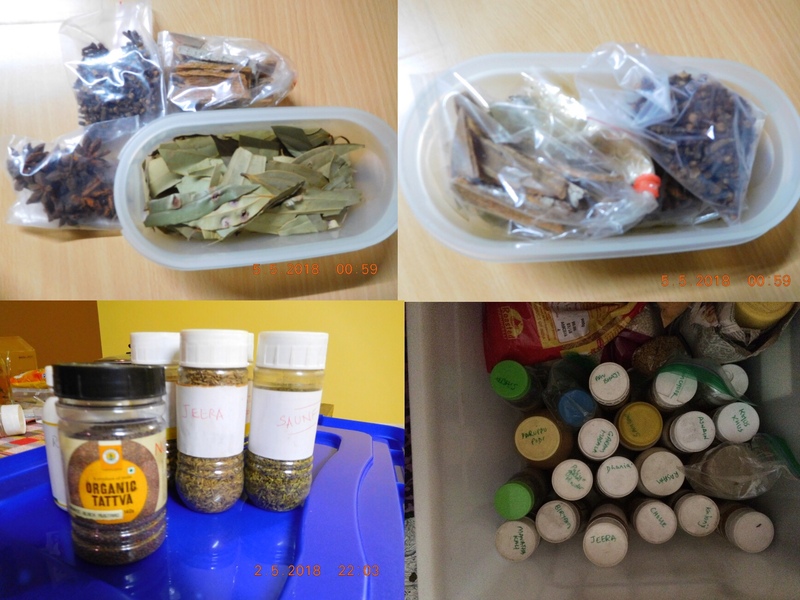 I always carry 100 – 250 gms of Urad, Arhar, Moong and Chana dal and replenish as we move. I do carry rice flour if we are travelling in the north but not in the south. Poha and Rawa are optional items to carry with you – they are available in most cities. Since I took the pic using the iPad, you can see it reflected in the inner box :). These nested boxes are really handy as they end up giving you enough vessels to work with and at the same time get stored in a small space. Besides all this I carry a non-stick tawa for making dosas. While this time I carried the mixie with just three jars, I usually need only the hand blender. The mixie is needed if you plan to make idlis and dosas. 6. Some essentials – the 15amp to 5 amp converter for the induction stove’s plug. We were caught out in Rameswaram in 2015 and luckily found one in an electric store there. It goes with us everywhere now. 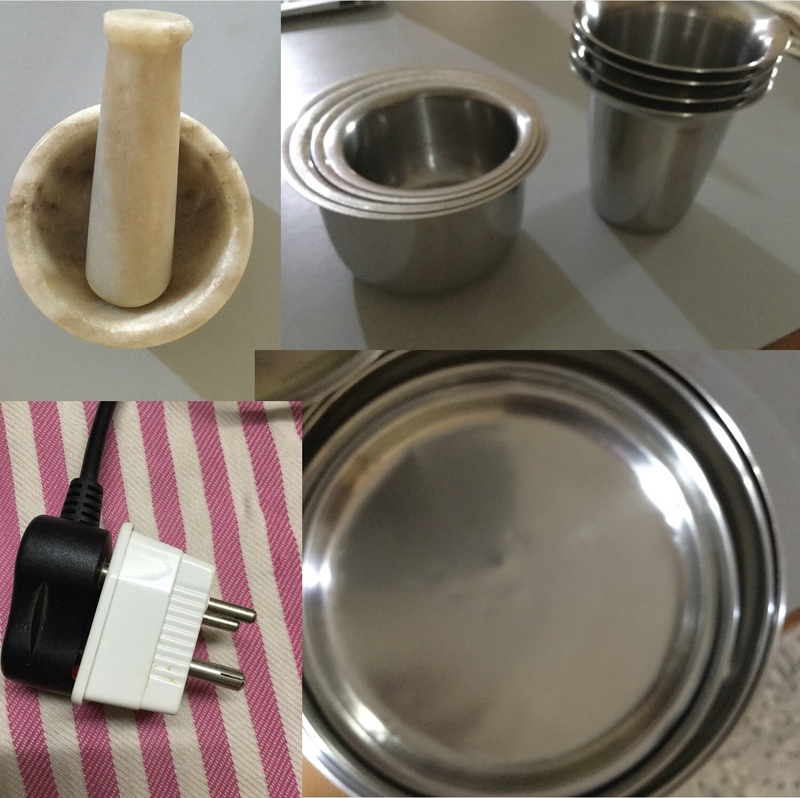 A tiny mortar and pestle for coarsely grinding masalas and making coarse ginger garlic paste. Nested plates, tumblers and cups are very handy and much needed. Now you see why its easy for us to cook fresh food everywhere and OPOS has spoilt us so much that hotel food doesn’t appeal at all. While on this trip, we enjoyed fresh food at Hyatt Lucknow for breakfast, the breakfast at Hotel Rivatas in Varanasi was just not palatable. The restaurant had a musty smell and the food was definitely not fresh :(:(. Couldn’t eat even the idlis as they smelt strange. OPOS and local eateries came to our rescue. A few days back I saw that horrendous video and pictures of a Subway outlet that served live cockroaches in the ice tea and the whole outlet was infested with cockroaches. Have been unable to eat restaurant food ever since :(. Hygiene conditions are rather poor in most restaurants and India does not implement food safety norms (FSSAI) stringently enough. We need a “Swachh Poushtik Khana” campaign and hope NaMo launches that soon enough. Besides food adulteration, its also wrong food storage and cooking methods. Do catch a few “Kitchen Nightmares” episodes and you wouldn’t want to eat at many of the restaurants in the US even !! Anyway – thanks RK and OPOS, our fresh food fetish is served well. Learn OPOS and eat fresh tasty food anywhere !! Buy the OPOS Cookbook – 5 minute magic on Kindle. Impressive. You are a travelling restaurant. With all that preparing and cooking, it’s amazing you have time to do anything else. Do you have room to pack your saris? Happy trails. Thanks Katharine. We travel by road and I do carry these spices in a box easily. Not all the items mentioned are made everyday, just one or two of them get made :):). 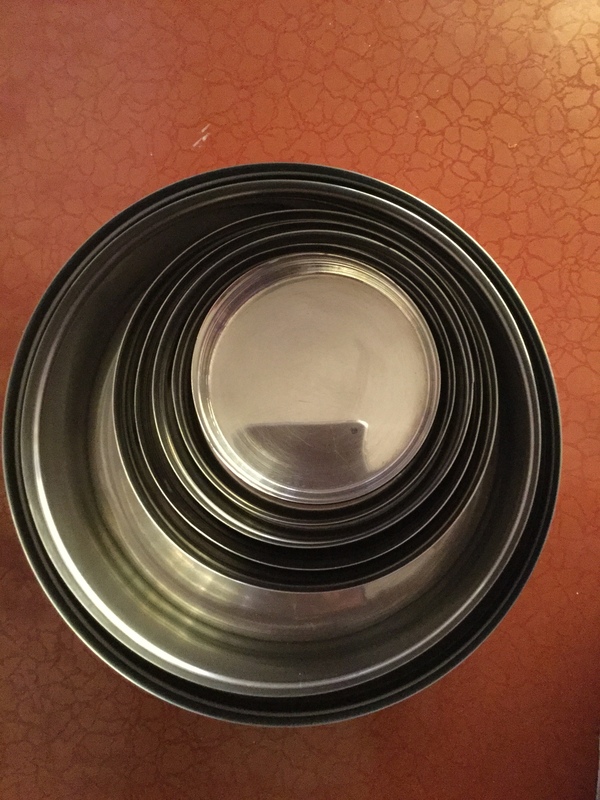 And this method that I speak of – OPOS (One Pot One Shot) actually makes it really easy and I haven’t spent more than 30 minutes on any day in cooking. You make me aware there are many culinary treasures I have yet to taste. Makes my diet seem boring, indeed.